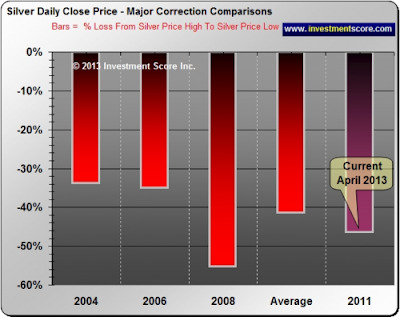 I have been a part of three gut wrenching silver price drops since I began investing in the asset class in 2005. I remember thinking that it would never again cross the $15.70 mark after it fell from that level to about $11 in early 2006. The following chart from Investment Score shows the last few price corrections in relation to the current pull back. This chart was put together as of Friday, and the drop reached about 53% this morning (bringing it around the range we saw during the panic of 2008) from the highs in April 2011. As I discussed earlier regarding gold, everyone who was interested in purchasing silver in the high $40's two years ago is only interested in selling today.